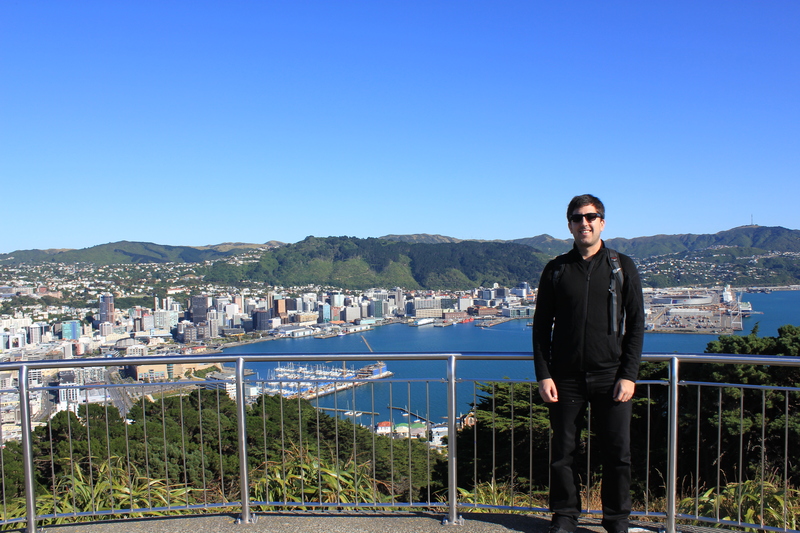 The rim of mountains surrounding Wellington is quite beautiful, and the nearby Victoria Peak in particular has an easily accessible lookout. I say easily, but that is because we have a car, and were able to drive up the multitude of switchbacks with very little physical effort. This is contrary to 99% of the other early risers we encountered, who were making the trek either on bicycle or just by running/walking up and around. We drove from our hostel along Oriental Parade and around Evans Bay before making our way up to the peak, and since we were up relatively early, we were able to experience the beauty of a small city waking up and see how the early morning community members start their day (dog walkers, cyclists, walkers, etc…). We definitely felt like we were cheating by driving around in the car, but it definitely enabled us to see more than we otherwise would have been able. After spending a couple hours gawking at the beauty, we headed back down the ‘mountain’, and not a moment too soon: the lookout areas were beginning to swell with tourists, and we encountered more than a couple tour buses making their way up top to dump a giant load of people even lazier than we were. By this time, the caffeine headaches had began, so we decided to stop at a local cafe to get our morning hit. I’ve yet to find a consistent naming convention for sizes/strengths of coffee, so I’ve pretty much resorted to just asking for a ‘long black’ everywhere I go and seeing what I get. Some places just give me espresso, others water it down into an Americano, and others I have no idea what they give me, but in general the coffee culture here is pretty good even though $3.50-$4.50 is a bit high of a price to pay 1-2 times every day. We had taken advantage of the free overnight street parking between 8pm-8am on Fridays, and 6pm-8am on Saturady/Sundays, but now we didn’t want to lug the car around all day, so we dropped it off in a paid lot (4$ flat up to 6pm) and then continued to explore our surrounding areas. We (Julie;) did some more shopping for Icebreaker at various stores, and we made our way towards the Te Papa Museum (free admission!) which we were to explore before meeting my friend Joseph Crawford from elementary and high school who now lives in Wellington and who was going to show us around. First we hit up Joe’s Garage for brunch (23$NZ for eggs, sausage, and toast… delish, but still expensive compared to Canada), then walked around the Te Papa museum some more (worth repeating that admission was free, because it was a very nice museum!) for a bit before heading up Cuba St. (which had a very similar feel to Queen St. West in Toronto) to the Southern Cross patio. I love patios, and Joseph definitely nailed this selection of establishment. After trying out a few local beers (Chomp Pale Ale from Black Dog , and Pils ‘n’ Thrills from Garage Project), we walked back to pick up our car before the lot closed at 6pm and hit up the beautiful waterfront one more time. On the way home, we picked up groceries at the local New World (Loblaws equivalent), made dinner!!! (corn and sausages) and took an early bedtime because we were taking the ferry to the South Island the following morning. Adam, order a flat white. That’s how most of the kiwi’s and aussie’s take their coffee.